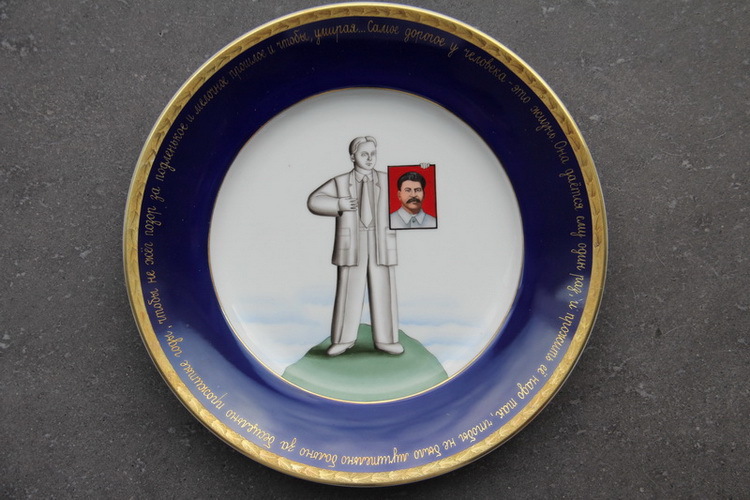 «Stalinist imperial porcelain of the 1940s, celebrating the victory over theNazis as well as the generals, heroes and leader of the war, was expertly produced and generously decorated. Taking Sévres and Russian imperial porcelain as models, Soviet master craftsmen made gener­ous use of deep cobalt and gold with engraving. Oak and laurel leaves, engraved onto the gold, symbolized honor, glory, and power. I used this technique in my work on the series of plates called «Fundamental Lexicon». For this purpose, I found, at the Kuznetsov porcelain factory, old masters who still remembered the secrets of the craft. The series consists of nine objects. Along the edge in gold letters runs a text memo­rized by millions of Soviet people: an excerpt from a monologue by Pavel Korchagin, urging a life sacrificed in the name of the «happiness of humanity»: «The most precious thing we have islife itself. It is granted to us just once and it must be lived so that we need never torment ourselves over years spent to no purpose, nor burn with shame over a petty and mean-spirited past, so that on our deathbed....» The text breaks off on its own deathbed, in memory of the hundreds of thousands of people who perished following the advice of the hero of Ostrovsky's novel, «How the Steel Was Tempered». The characters correspond in many ways to the sculptural group «Life is Everywhere». The heroes are placed on the top of a mountain, in the heavenly ethers, symbolizing their absolute nature and their perfection. Among them are strange, absurd, or «incorrect» images. For example: the teacher with the chart showing the circulatory system in the human body, the prisoner with the slogan «To freedom with a clear conscience», the Soviet scientist studying lightning. The whole work is to a great extent absurd and ironic. Irony and the absurd are not used for ridicule, but as a way of describing life».